I loved the Horse Star game when it first came out. It had fantastic graphics - and it was free. You could choose a horse from several breeds, choose a color etc., groom, train and ride it. It is expected to be open again around December 2012 on Facebook. So you'll have to wait for it to come out again. As soon as I hear it is available, I will be sure to post it on this page! Following are reviews from the old game. Once the new game is out, we'll be sure to post reviews and tips from the new version! It's 2016 and there still is no Horse Star. I checked Facebook and there isn't even a page on Horse Star. I guess they just deleted it or something. still no horse star and its 2015 like come on let us play online. still no horse star on facebook and it's 2014 and it's not on online I don' know what happened! there is no horse star at all! nothing and the one thing i did find was in french and its a pc game you can only buy there. its like it just dropped of the face of the earth. 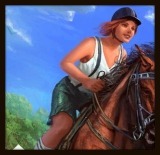 but if you really want a cool game you can play and ride and do quests and pick your own horse. try Star Stable. its still not on facebook? and it's almost 2014. Why horse star is not on facebook I just want to have this game soooooooooooo much and I can't find it. Horsecarygirls.com are saying that this game is moving to facebook and I check it I did write horse star and then when I did it it was just no game it was just some pictures of other horses. IT'S NOT MOVING TO FACEBOOK AND NOT ONLINE. 1. yes 2. you can't. do you have to download horse star? how do you play the game on facebook? Great starclan! Calm youselves down everyone! We know you are many following the Facebook Page and waiting for the new version of the game we are working on. We planned to release it at the end of this year but, as often, the time we need to achieve the quality we’d like to offer you is longer than expected. But be sure it’s for the best. We hope to be able to provide you soon and as often as possible, news about the development of the game and go on sharing with you horse passion through activities and competitions. I never got the chance to play Horse star and looks awesome! What does the controls work. When I watched a video of horse star on youtube, the screen keep on moving. Is there a way anyone could tell me or show me, please. Hi everyone, on Horse Stars Facebook-page they state that Horse Star will NOT be a Facebook-game, but an online game. Don't worry peeps, you won't need a Facebook-account! All the best games are dead :( The riding club championships, Horse Star, My horse club... Why, people, WHY???!!! I used to play horse star and let me tell you it was the best horse game I EVER played! I don't know what happened but I heard rumors about another game company buying it off of the owners because the owners could no longer afford it. The rumor said they will come out with the game later on in the year and maybe early next year but again that's just a rumor. If anyone knows what happened could you please reply to this comment. I miss playing the game and hanging out with all my friends on it. I tried emailing them but it would not send probably because they shut down their email but I noticed they did not shut down their facebook account.